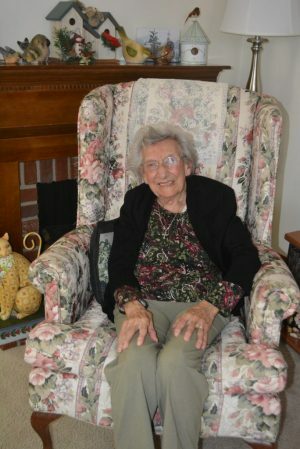 COSHOCTON – When Gwendoline “Gwen” Stotler’s husband Harold got a job as the city and county sanitarian, the two moved from their farm outside of Zanesville to Coshocton County in 1953. However, their story goes well beyond the borders of Coshocton County to a small town in Manchester, England where Gwen was born and raised. Although Gwen will be 100 years old on Tuesday, Feb. 12, her mind is as sharp as ever and she can share stories of her childhood, the war, how she met Harold, and her first impression of the United States with detail, accuracy, and of course, a lovely English accent. Gwen was born in 1919 in Stockport, Manchester, England and later moved to 33 Birchfield Road with her family. She was proud of the fact that she can still remember her childhood address. However, Gwen’s early 20s were anything but ordinary. As a young woman in war-ravaged England, Gwen remembers blackouts, air raid sirens, and German fighter planes blanketing the sky. During the war, Gwen worked for the gas and electric company as a telephone operator and was in charge of putting orders through from various countries. After the blackouts started and Germany bombed London, Gwen was in charge of operating the air raid sirens that were located on the roof at the gas and electric company. When a blackout was announced on the radio, she would turn on the sirens. Toward the end of the war, the government made her quit her job at the gas and electric company to work at an airplane factory making sprockets for airplanes. This change was due to the shortage of men who could fill that job. Gwen said that even though she lived through the uncertainty of war, she was able to talk with friends at her place of employment and they banded together to try to forget the tragedy of war. It was after the American soldiers arrived in England that Gwen met her future husband at a dance. Harold was a sergeant and in charge of the mess hall and meals for the troops. Gwen had eyes for one of Harold’s friends, an Italian named Tony. However, fate had other plans for the couple. After Harold was transferred to other places in England, Gwen would take the train to see him whenever she could. The two were married after the war ended on March 10, 1946. In December of that year, their first-born son Chris was born and the next year, when he was only six and a half months old, the family came to the United States. The couple lived with Harold’s mom and dad in Newark for a while and Harold helped his father paint houses for a living. Harold and Gwen then bought a small farm in Gratiot outside of Zanesville. The family moved to Coshocton in 1953 when Harold got a job as the city and county sanitarian. He was instrumental in implementing the mosquito control program. In 1958, Gwen’s parents came over to the United States on the Queen Mary and settled in Coshocton to be near to their grandchildren. Over the years, the couple made memories by taking many family vacations together, mostly to a remote fishing cabin in Canada. After Harold retired, the two spent a lot of time in Florida and bought a house in the sunshine state in the mid-1970s. They spent 35 winters in Florida together in the Bonita Springs and Estero areas. As Gwen never learned to drive, she loved to ride her bike down to the end of her road in Florida where there was a strip mall and she could go shopping. She still enjoys walking to Buehler’s in Coshocton and likes talking to the employees there. Gwen used to reupholster furniture after the move to Coshocton to help supplement the family’s finances. The couple also owned Stotler’s Christmas Tree Farm out by Keene. “I remember when the kid’s friends would come to the farm and they would go skating and I would always make them hot chocolate,” she said. She and Harold were married for 68 years until Harold passed away in 2014. The couple have four children: Chris (Marsha Bates) Stotler, Steve (Sharlee) Stotler, Cheri (Mark) McCullough, and Jackie (Matt) Steele; 13 grandchildren, nine great-grandchildren, and many nieces and nephews. Family and close friends will be celebrating Gwen’s birthday privately at a later date.